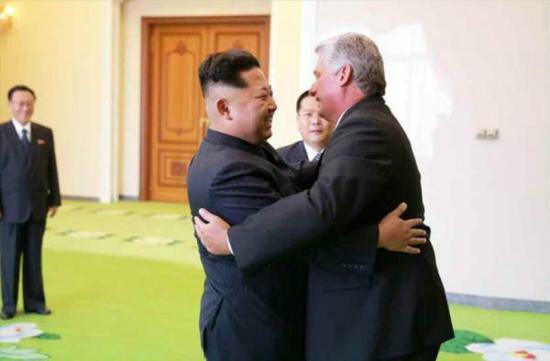 The meeting between Kim Jong-un, leader of the Democratic People's Republic of Korea (DPRK) and a visiting Cuban delegation led by the country's number two, Miguel Díaz-Canel Bermúdez, on September 7, may herald a new diplomatic era in North Korea. It is the first such event since he met Chinese Vice President Li Yuanchao on July 25, 2013, who arrived in Pyongyang to attend the celebrations marking the 60th anniversary of the ceasefire on the Korean Peninsula . The diplomatic charm offensive launched by the DPRK in the second half of last year has failed to achieve expected results since it was carried out on the prerequisite of trying to skirt around the deadlock in the nuclear issue in the face of the campaign by China, Russia and the United States to urge denuclearization of the peninsula. The rumor mills also churned suggestions that Kim planned to visit Russia and China to attend the 2015 Moscow Victory Day Parade in May and China's 70th anniversary celebrations in early September to commemorate the victory in its War of Resistance against Japanese Aggression (1931-1945) and the World's Anti-Fascist War. However, nothing materialized on these fronts. During the four years of Kim's presidency, the international isolation of DPRK has deepened rather than eased. Therefore, the high-profile reception given by Kim to the visiting delegation led by Bermúdez, likely to be the next Cuban leader, a few weeks ahead of the 70th anniversary of the establishment of the Korean Workers' Party on Oct. 10, 2015, is understandable. The diplomacy of DPRK this year seems aimed at achieving some stability. In May 2015, Kim Yong-nam, chairman of the Standing Committee of DPRK's Supreme People's Assembly, attended the May 9 Moscow celebrations, which marked the 70th anniversary of the Soviet Union's victory over Nazi Germany in World War II. Meanwhile, Choe Ryong-hae, a member of the Politburo Presidium and the secretary of the Central Committee of the Workers Party of Korea, on behalf of Kim, visited China to attend the China's Victory Day Parade in Beijing. The meeting between the leaders of North Korea and Cuba may indicate more openness in the former's diplomacy.